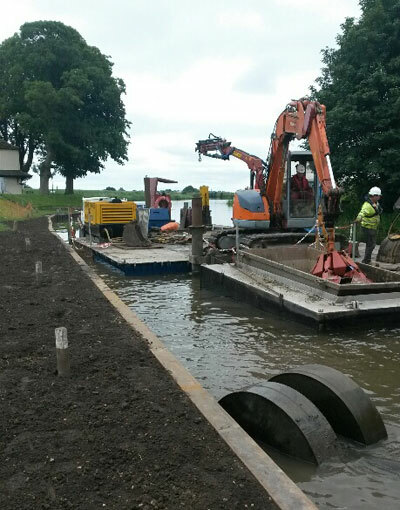 The landlord of a riverside pub and restaurant has expressed his appreciation for the way in which Team Van Oord (TVO) planned and executed a project on the banks of the Great Ouse in Norfolk. 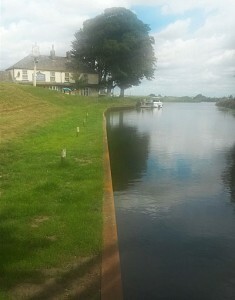 The Ship Inn at Brandon Creek lies just off the A10 between Ely and Downham Market, at the point where the Great Ouse and Little Ouse Rivers meet. The business is operated by father and son team, Keith & Mark Thomas, who share a passion for locally sourced, freshly cooked, naturally gluten free food and drink, served in relaxed waterside surroundings. Working on behalf of the Environment Agency, TVO has recently completed a scheme to remove asbestos piles and replace them with new steel piles and capping beam along a stretch of the Great Ouse embankment. The works, carried out with floating plant, were phased to minimise impact on local businesses and river users. The team prioritised sections where the asbestos piles were most seriously damaged. One stretch, which affected The Ship at Brandon Creek and included moorings adjacent to the pub, had completely failed and required immediate action. The potential consequences for the pub and restaurant business were serious, with a number of functions booked to take place throughout the summer 2016. Perry Dale, Team Van Oord’s Contracts Manager for the project, said: “We spent considerable time liaising with the landlord to mitigate the impact of our works. “Our site management and operations team worked closely with the landowner and landlord, and all parties were in constant communication throughout the scheme. Writing after the works were completed, Keith Thomas said: “I am writing to say how much we appreciate the work that has been completed recently. “On behalf of ourselves and our regular boating customers, please pass on our many thanks (to the team). “I would also like to compliment the team from (TVO sub contractor) Drake Towage – they were excellent, diligent in their efforts and could not have been more helpful in maintaining access whenever possible.